“For several months preceding the event, the Sanhedrin had worked to contact foreign governments, inviting them to take their place as representatives of the 70 nations who populated the world, listed in the Bible as the grandsons of Noah. Honduras, Guatemala and Mexico answered the call, sending high-ranking delegations to attend. “Rabbi Hillel Weiss, spokesman for the Sanhedrin described that the concert has a vital role to play in helping the nations of the world in joining together to address these universal threats the world today. On the home front, President Trump may yet declare a national state of emergency in order to secure the southern U.S. border with a steel barrier. These events, plus the inevitable civil unrest, would be the perfect storm for Trump to declare Martial Law, which would suspend the Bill of Rights. The inalienable rights of American citizens would be lost overnight: Freedom of Religion, Speech, and the Press, The Right to Bear Arms, the Right to Life, Liberty, and Property, the Right to a Speedy and Public Trial by Jury, with the Presumption of Innocence and Due Process under Constitutional Law and Domestic Privacy; also forfeited would be Protections from Excessive Bail, Fines, Cruel and Unusual Punishments, Unreasonable Searches and Seizures. Christians have for the most part expressed solidarity with Trump’s genocidal crusade in the Middle East and a border wall, which may end the tidal wave of illegal immigration but will also prevent U.S. citizens from leaving the country when their Constitutional rights are abrogated. Many Christian churches have been infused with the liberal Social Gospel through government and corporate faith-based funding, which requires them to welcome sexual perversion into their congregations. Most seminaries have been receiving these federal and corporate grants for years, which explains why young ministers today think they must ‘engage the culture’ and ‘work for the common good’ instead of preach the gospel. Mankind is presently rushing headlong into this Tribulation period but large swaths of the Church seem not to notice. The Reformed think the theocracy they are building is the Kingdom of God. Instead of stanching the floodtide of sin in the culture, the apostate Church has joined the culture and is leading the human race to Judgment. Luke 21:35 warns “For as a snare shall it come on all them that dwell on the face of the whole earth.” The day of the Lord will take the world and the apostate Church by surprise. Jonathan Leeman has Masters degrees from the London School of Economics and Southern Baptist Theological Seminary. He also has a Ph.D. in “political theology” from the University of Wales which was established by Royal Charter in 1893 and whose Chancellor is Prince Charles of Wales. The London School of Economics is not found in Leeman’s various biographical profiles probably because it was funded in 1894 by the Third-Way socialist/fascist Fabian Society which established the LSE to educate and train an elite workforce to carry out the schemes of the British Eugenics Society. 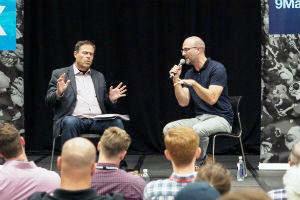 IX Marks, the organization of Cambridge-educated Mark Dever, equips pastors and church leaders to preach and put into practice the Social Gospel. Most of the Reformed leadership have advanced degrees from universities in the United Kingdom—Oxford, Cambridge, London School of Economics, University of Edinburgh—whose liberal theology and politics have liberalized the Church of England and the UK. This description resembles the “political theology” of the Roman Catholic Church which blended Old Testament theocratic rule with Babylonian worship. We have seen how their “church polity” has turned out. (See Mystery Babylon: Catholic or Jewish?) In fact, political theology is a course of study in Catholic universities such as the Catholic University of America in Washington, DC and Villanova University in Pennsylvania. Jonathan Leeman's Political Church is calculated to Judaize and politicize the Christian Church. Leeman conceives of the New Testament Church as a political institution having a legal contract with God—a ‘new covenant’ which is an extension of the old covenants between Yahweh and his former ‘subjects.’ Leeman’s version of the new covenant minimizes the personal and intimate relationship between the Jesus Christ and His Church. Salvation is a legal arrangement, a contract, after which the Christian is ‘tasked’ as a ‘citizen’ installed in the ‘body politic’ of Jesus’ ‘regime’ with the civic duty of displaying God’s righteousness to the world. Jesus’ regime? The language is absurd, portraying Jesus as a military dictator instead of a Savior. Did God so hate the world that he sent his only begotten Son to establish a ‘regime’ and a ‘political institution’ to improve his image and enforce his commands in the world?” Maybe in the Political Bible but not in the inspired Word of God. “The death of the Lord Jesus is inclusive. The resurrection of the Lord Jesus is alike inclusive. We have looked at the first chapter of I Corinthians to establish the fact that we are ‘in Christ Jesus’. Now we will go to the end of the same letter to see something more of what this means. In I Corinthians 15:45,47 two remarkable names or titles are used of the Lord Jesus. He is spoken of there as ‘the last Adam’ and He is spoken of too as ‘the second man’. Scripture does not refer to Him as the second Adam but as ‘the last Adam’; nor does it refer to Him as the last Man, but as ‘the second man’. The distinction is to be noted, for it enshrines a truth of great value. “As the last Adam, Christ is the sum total of humanity; as the second Man He is the Head of a new race. So we have here two unions, the one relating to His death and the other to His resurrection. In the first place His union with the race as ‘the last Adam’ began historically at Bethlehem and ended at the cross and the tomb. In it He gathered up into Himself all that was in Adam and took it to judgment and death. In the second place our union with Him as ‘the second man’ begins in resurrection and ends in eternity—which is to say, it never ends—for, having in His death done away with the first man in whom God’s purpose was frustrated, He rose again as Head of a new race of men, in whom that purpose shall be fully realized. “Recommissioned in Adam’s office. For our purposes here, we are interested in the fact that the church identifies with Christ in his Adamic office, and that the church is deputized as possessing a renewed Adamic commission. Just as Adam played the role of Everyman and federal head, meaning that all humanity received the commission given to him, so Christ plays the role of second Everyman and second federal head for a new humanity (see Rom 5:12-19). If, then, Adam’s office transmits to Christ, it would seem that the same office likewise transmits to Christ’s people. Greg Beale observes, It is important to recall that Jesus’s titles ‘Son of Man and ‘Son of God’ reflect respectively both the OT figures of Adam and Israel. This is because . . . Adam and Israel are two sides of one coin. Israel and its patriarchs were given the same commission as was Adam in Gen. 1:26-28. . . . The church is also identified with what it means to be the true Adam, especially in its identification with Jesus, the true Israel and last Adam. Where does God’s Word say, “the church puts on Adam’s political and priestly vocation.” Leeman’s political theology, which is liberal theology, gives him license to expound a social gospel which is about fixing this world system. Note well the reference to tikkun olam (the repair of the universe) in the excerpt from his book below. The social gospel fosters preoccupation with worldly affairs and law-keeping... instead of the believer’s heavenly citizenship with all spiritual blessings in Christ. Jonathan Leeman seems to have a low view of the ‘new covenant’ (lower case) as being inferior to the old covenants. The new covenant is merely added onto the series of God’s covenants—the Adamic, Noahic, Abrahamic, Mosaic, Davidic—which are incorporated in what is (falsely) termed the Noahic Covenant. “The Bible necessarily holds that the covenantal relationship is the only proper basis for political organization—that is, the structured allocating of authority and power among humans—as well. In a political sense, biblical covenants take the form of constituting acts that establish the parameters of authority and its division without prescribing the constituting details of regimes. “Thus, the Sinai covenant establishes once for all God’s kingship over Israel and the partnership between God and Israel in tikkun olam* (the repair of the universe). It does not establish any particular political regime. “We can therefore define politics as the mediating of God’s covenantal rule, a definition that encompasses the concept both narrowly conceived (in reference to a society’s governing institutions) and broadly conceived (in reference to all of life). “Politics narrowly conceived implements God’s sword-wielding covenantal rule invisibly through the justice mechanism of the Noahic covenant (Gen 9:5-6) and visibly through the oaths and institutions of the special covenants. “Politics broadly conceived is the acknowledgment that all of life exists within the jurisdiction of God’s comprehensive rule or judgment (as indicated in the Adamic covenant), yet it awaits the visible performance of that judgment in the eschaton (the larger share of the Noahic covenant: Gen 9:1-3, 7-17). “The Bible does not moralize the manner in which a government should be formed or the earthly foundation of its sovereignty. In this regard, Christian political philosophers have something to learn once again from Jewish counterparts. Daniel Elazar and Stuart Cohen offer an instructive word from their own tradition: The Jewish political tradition, like every other political tradition, is concerned with the question of power and justice, but it differs from the political traditions growing out of classic Greek thought in that it begins with a concern for relationships rather than structures. More specifically, it is less concerned for the best regime than with the proper relationships between power and justice, the governors and the governed, and God and man.” (pp. 189-190). May we ask, was the Jewish nation on display in the Old Testament a just body politic until God overthrew the whole system in 70 A.D.? What about the “post-biblical Jewish commonwealth”? Have the Jewish people been a stellar example of righteousness through faith in Jesus Christ since they crucified Him? By what standard does Jonathan Leeman evaluate “a proper set of political relationships?” Does God require a “proper set of political relationships” or does He require people to be in a proper relationship with Himself through faith in His Son? Under the Noahic Covenant, the stated divinely ordained purpose of human governments is to enforce the worship of God and the religion of the Old Testament. “Seventh, the governments of this world exist to aid and abet the cause of true worship by providing the platform for the activity of Adamic citizenship... The proximate goal of government may be judgment. But this proximate goal must not be separated from the ultimate goal, which is to help subjects become citizens and worshipers. Where did Jonathan Leeman come up with this Judaized version of Christianity? The Chabad Lubavitch Worldwide Institute of Noahide Code presents the same false interpretation of the Old Testament covenants that Jonathan Leeman presents in his book, except the Chabad does not mention their plan for New Testament Church. “G-d gave the first six commandments to Adam and Hava (Eve), the first human beings. “The entire Book of Genesis, and the Book of Exodus up to and including the arrival of the Israelites at Mount Sinai, were dictated by G-d to Moses when they arrived there. There was then a first covenant made between G-d and the Israelites on that first part of the Written Torah, which included their acceptance of the Noahide Code. Thus, the Divine moral code of Seven (Universal) Commandments was renewed, after it had become neglected by the rest of the nations. That was four days before the Ten (Jewish) Commandments were spoken openly by G-d to all of the Israelites, at which point they became the Jewish people. On the list of UN NGOs is also the Ethics & Religious Liberties Commission of the Southern Baptist Convention. As previously mentioned, Jonathan Leeman is the Editorial Director for the IX Marks church planting operation of Mark Dever, who is pastor of Capitol Hill Baptist which is Southern Baptist. 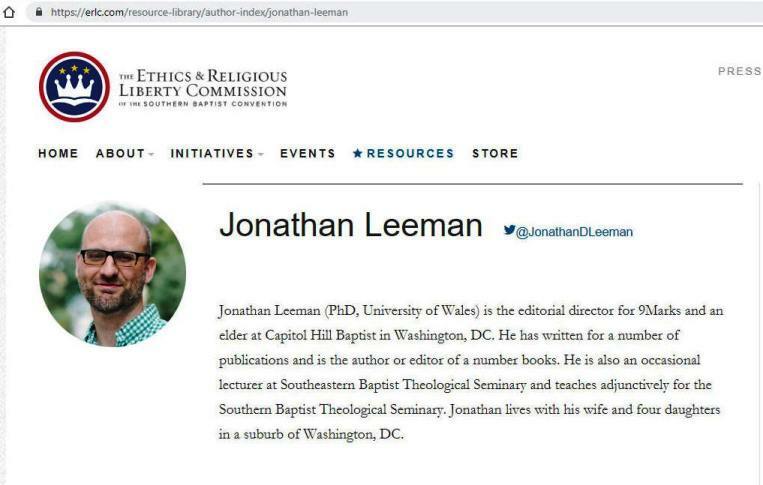 Leeman also has a Masters degree from Southern Baptist Theological Seminary, is an adjunct professor and lecturer at SBTS and is affiliated with the ERLC. Professor Leeman does not enumerate the laws contained in the Noahic Covenant except to state that they incorporate the commands of the covenants God made with Adam, Noah, Moses, Abraham and David. The Jewish Encyclopedia states that 7 Laws were derived from the Torah by Jewish Rabbis who codified them as the Seven Noachian Laws and made them binding on all mankind. These seven laws actually originated in the Babylonian Talmud. “In the elaboration of these seven Noachian laws, and in assigning punishments for their transgression, the Rabbis are sometimes more lenient and sometimes more rigorous with Noachidæ than with Israelites. With but a few exceptions, the punishment meted out to a Noachid for the transgression of any of the seven laws is decapitation, the least painful of the four modes of execution of criminals (see Capital Punishment). The many formalities of procedure essential when the accused is an Israelite need not be observed in the case of the Noachid. The latter may be convicted on the testimony of one witness, even on that of relatives, but not on that of a woman. He need have had no warning (‘hatra’ah’) from the witnesses; and a single judge may pass sentence on him (ib. 57a, b; ‘Yad,’ l.c. ix. 14). With regard to idolatry, he can be found guilty only if he worshiped an idol in the regular form in which that particular deity is usually worshiped; while in the case of blasphemy he may be found guilty, even when he has blasphemed with one of the attributes of God’s name—an action which, if committed by an Israelite, would not be regarded as criminal (ib. 56b; see Blasphemy). The Noahide Laws are also found in Freemasonry, the secret fraternal organization which descended from the medieval order of the Knights Templar—the Knights of the Order of the Temple of Solomon. According to Albert Mackey’s History of Freemasonry, Rev. James Anderson, the Presbyterian minister and theologian who wrote the Constitutions of Freemasonry, developed the Noachide legend from Ancient Egyptian mystery religion of Hermes Trismegistus, author of the Hermeticum, and the moral laws for Freemasons which were derived from the Rabbinic laws of Talmudic Judaism. Mackey wrote concerning the importance of Noah and the Noahide laws in the Constitutions and Charges of Freemasonry. “Anderson, who, in the Book of Constitutions modified and enlarged the old Craft Legends at his pleasure, calls Noah and his three sons ‘all Masons true,’ and says that they brought over from the flood the traditions and arts of the antediluvians and communicated them to their growing offspring. And this was perhaps the first time that the Patriarch was presented to the attention of the Fraternity in a Masonic character. “About that time, or a little later, a degree was fabricated on the continent of Europe, bearing the name of ‘Patriarch Noachite,’ one peculiar feature of which was that it represented the existence of two classes or lines of Masons, the one descending from the Temple of Solomon, and who were called Hiramites, and the other tracing their origin to Noah, who were styled Noachites... the term...has become of so common use that Noachida and Freemason have come to be considered as synonymous terms. “What does this word really signify, and how came Anderson to adopt it as a Masonic term? The answers to these questions are by no means difficult. “Noahchida, or Noachides, from which we get the English Noachite, is a gentilitial name, or a name designating the member of a family or race... And so Noachides, or its synonymous Noachida or Noachites, means descendant of Noah. “But why, it may be asked, are the Freemasons called the descendants of Noah? Why has he been selected alone to represent the headship of the Fraternity? I have no doubt that Dr. Anderson was led to the adoption of the word by the following reason. “After Noah’s emergence from the ark, he is said to have promulgated seven precepts for the government of the new race of men of whom he was to be the progenitor. “These seven precepts are: 1, to do justice; 2, worship God; 3, abstain from idolatry; 4, preserve chastity; 5, do not commit murder; 6, do not steal; 7, do not eat the blood. “These seven obligations, says the Rev. Dr. Raphall, are held binding on all men, inasmuch as all are descendants of Noah, and the Rabbins maintain that he who observes them, though he be not an Israelite, has a share in the future life, and it is the duty of every Jew to enforce their due observance whenever he has the power to do so. “In consequence of this, the Jewish religion was not confined during its existence in Palestine to the Jewish nation only, but proselytes of three classes were freely admitted. One of these classes was the ‘proselytes of the gate.’... They were not admitted to all the privileges of the Jewish religion... So that, although they were Noachidæ, they were not considered equal to the true children of Abraham. “One shining example for people of all faiths of what education ought to be is that provided by the Lubavitch movement, headed by Rabbi Menachem Schneerson, a worldwide spiritual leader who will celebrate his 80th birthday on April 4, 1982. The Lubavitcher Rebbe’s work stands as a reminder that knowledge is an unworthy goal unless it is accompanied by moral and spiritual wisdom and understanding. He has provided a vivid example of the eternal validity of the Seven Noahide Laws, a moral code for all of us regardless of religious faith. May he go from strength to strength. 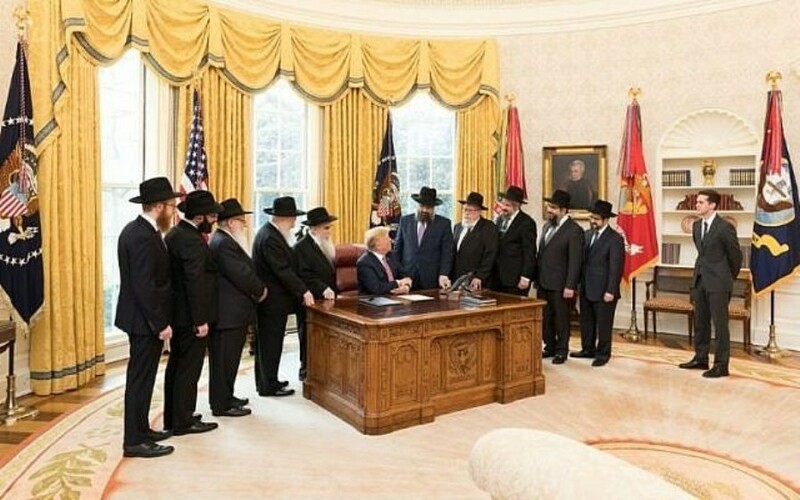 “In recognition of the Lubavitcher Rebbe’s 80th birthday, the Senate and the House of Representatives of the United States in Congress assembled have issued House Joint Resolution 447 to set aside April 4, 1982, as a ‘National Day of Reflection. 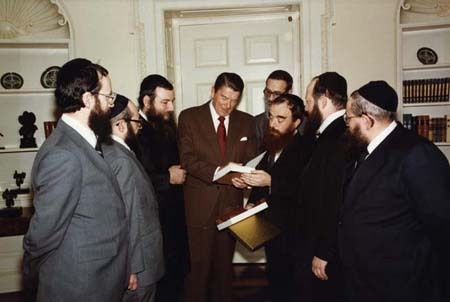 Nine years later, in 1991, the Seven Noahide Laws became Public Law 102-14 after a vote by the U.S. Congress on the recommendation of Reagan’s successor, President George H. W. Bush, a member of the Masonic Order of Skull & Bones (’48). 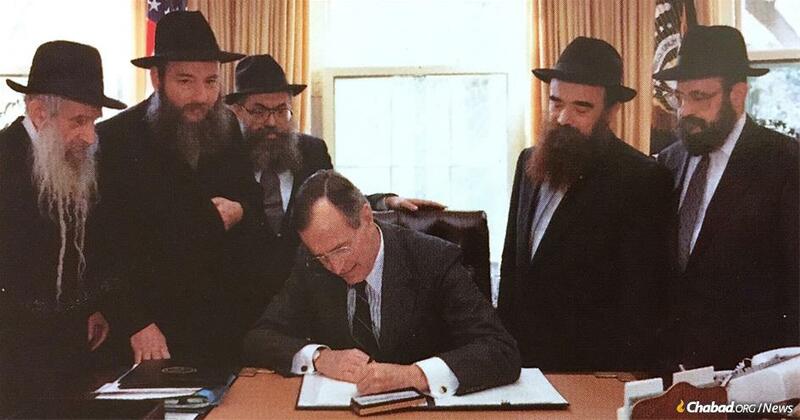 Before a joint session of Congress, President Bush honored Rabbi Menachem Schneerson, the now deceased “messiah” of the Lubavitch Movement, by establishing the observance of Education Day, USA. This national observance was intended “to return the world to the moral and ethical values contained in the Seven Noahide Laws.” In reality, P.L.102-14 established the Talmud as the supreme Law of the Land. 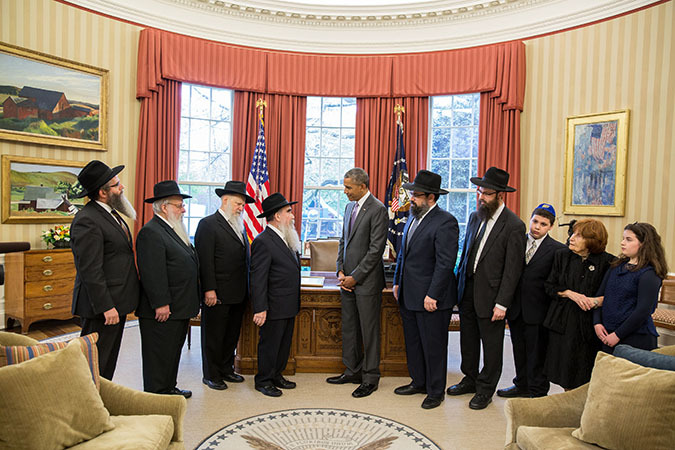 All U.S. Presidents since Richard Nixon have endorsed the Chabad Lubavitch Noahide legislation which the U.S. Congress passed as Public Law 102—14 (H.J. Res. 104) on March 20, 1991. 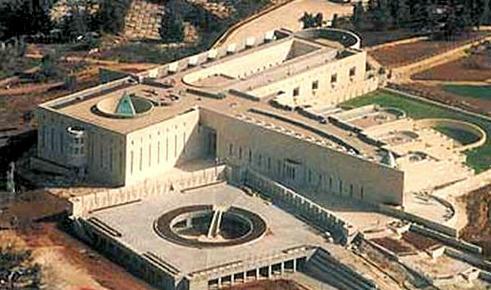 Furthermore, the Lubavitcher Universal Institute of Noahide Code, UN NGO (ECOSOC), being also an international movement, has been endorsed globally by world leaders who will be representing their countries in the Sanhedrin's Organization of 70 Nations in Jerusalem. “There are 72 Chabad centres in Canada. There are 37 centres in Quebec, 21 in Ontario, eight in British Columbia, two in Alberta and Manitoba and one in New Brunswick and Nova Scotia. These centres serve the needs of Jews no matter what their level of knowledge or observance. The Chabad Lubavitch claims that Jews enforcing the Noahide Laws and overseeing their execution will reverse the moral degeneration of mankind and restore the world to the pristine conditions that existed in the Garden of Eden before the fall of Adam and Eve. Their marketing ploy is that their utopian “new world order” of peace and universal brotherhood will reverse the moral collapse and the global chaos engulfing mankind. “As an example, Rabbi Stein described the resolution being drafted to make abortions and assisted suicides a ‘universal human right’ which the rabbi said violated the Noahide law prohibiting murder. Unfortunately, the real agenda of the Sanhedrin is not peace and justice for all but a dystopian world disorder that will destroy civilization. According to the Noahide Laws, Christians who worship Jesus Christ are guilty of idolatry. Source: “The Noachides and Rome’s Chief Rabbi, Riccardo Di Segni,” Father Francesco Ricossa, Sodalitium, French Edition, No. 53, July, 2002, translated by Suzanne M. Rini, Trans Et Alia, Vol. 3, Nowa 3, Sept. 2002. The Chief Rabbi of Rome was putting the Roman Catholic hierarchy on notice that the Jewish elite, which even now controls the world from behind the scenes, will soon have legal authority to prosecute and execute Christians for the crime of idolatry. According to the Sodalitium article, not one of the Vatican prelates protested the agenda of the Jews: “Today, the unthinkable has been realized. But the Cardinals present at the lecture of...Rabbi Di Segni, keep silent.” Nor did the prelates question the Jewish power in a court of law. In a 2006 meeting on Rome’s Capitol Hill, the same Rabbi di Segni who threatened the execution of those who worship Jesus Christ, met with Roman Catholic, Muslim and Jewish leaders in a show of interfaith unity. What do the leaders of Roman Catholicism, Islam and Jewry have in common? Are they conspiring to enforce the Noahide Laws to eliminate their common enemy, Christians and Christianity? In 2013, on March 20, which was the feast of Passover, Rabbi de Signi was warmly welcomed at the Vatican by Pope Francis. Meanwhile, in Jerusalem, Orthodox Jewish yeshivas have been educating Jews about the forthcoming Jewish monarchy, their Jewish privilege and the draconian Noahide laws. The Kingdom of Israel will be the Antichrist's servile slave state into which the damnable heresy of Dominionist / Kingdom Theology of the Calvinists is leading those who believe their false teachings. The first volume of “The King’s Torah” concerned laws relating to life and death between Jews and non-Jews. It detailed the laws that permit the killing of non-Jews under different circumstances – such as during wartime, or when a non-Jew threatens a Jew. Regarding non-Jews who do not observe the Seven Laws of Noah, they add that the Rambam says gentiles we conquer become like slaves to us; it is permissible not to return a loan to a gentile, since the failure to involve them in decisions amounts to less than expropriating a loan as it does not involve financial loss. “One of the primary organization’s goals and future purpose is to support a democratically run General Noachide Council that represents the interests and needs of ‘All’ Noachide Communities throughout the world, and ultimately to support a Supreme United Noachide Council composed of only qualified Noachide judges which will have graduated from a yeshiva for B’nei Noach in Israel. The Orthodox Jewish yeshivas are also teaching Christians. This is a trap for Zionist and Messianic Christians. They will not be learning the Torah but the oral traditions of the Rabbis, and Jewish magic from the Talmud, and the Kabbalah, which is Jewish mysticism and the Soul of Judaism. One of the first ventures of its kind, Root Source, was launched in April 2014 by Gidon Ariel, an Orthodox Jew, and Bob O’Dell, a Christian philanthropist and high-tech entrepreneur. Online subscribers to Root Source can access prerecorded lectures on topics such as biblical Hebrew, women in the Bible, Jewish prayer, the Holy Temple, God, Moses and the Book of Proverbs. Lambert Adler estimates that “a few thousand” Christians have participated in classes offered by this new crop of yeshivas now open to them. The only hindrance to growth, she said, is the lack of qualified and available teachers. “We tend not to trust them, we tend to think they have a missionizing agenda 100 percent of the time, and we tend to want them to just leave us alone,” she said. “The Jews see the destruction of their enemies as part of the deliverance of their god. They consider their actions as part of God’s divine plan for the destruction of the Amalekites. The deliverance of the Jews from all enemies became part of the plan for all ages. The Jews were to always be delivered from their enemies through their own actions. They did not wait for God to act. They took action unto themselves and asked God to bless it. It has been thus ever since. There is no turning the other cheek. There is no forgiving enemies or praying for those who despitefully used them. There is only death, and the death of their enemies meant God had blessed them. “Unfortunately, Christians believe the same thing. They too expect God to deliver the Jews from all modern enemies through overwhelming fire power. The death of innocents is just God’s blessing on the Jews. The Feast of Purim is from where this idea comes. God is expected to perform for “His” people regardless of repentance or righteousness. It is true the people fasted, but no where is it recorded that the fast led to a deeper knowledge of God and repentance from sin. That is because the Jew does not have any knowledge of personal sin. All sin is national. According to the Rabbis, Jews are ‘saved’ by their own blood. This destruction of their enemies by the Jews is known as the law of vendetta. We can see this law enacted every day in modern Israel. That is what happens when Jews come into political and military power. All who oppose them are marked for destruction and God will bless it. “The law-of-vendetta is a blood feud. There is no ending it. It is the Jewish Hatfields and McCoys. The law is based on old Babylonian law. It has found its way into modern jurisprudence under the name lex talionis, or law of retaliation. The Bible calls it an ‘eye for an eye.’ This means that the punishment should be equal to the offence. Of course, Jewish retaliation is always 10 times greater than the offence. That, too, was evident in the Book of Esther. Revenge is a trait so ingrained so deeply into the Jewish consciousness that it is almost genetic. A Jew never forgives and never forgets. They still avenge supposed wrongs to their tribe committed 1,000 or 2,000 years ago. The time “18:15” on Prince Harry’s iPhone is military time for 6:15 p.m. which may be a code for a date, probably on the Hebrew calendar, which is Adar 15, which is the Talmudic celebration of Purim. Purim is not a Biblical feast but a “day of the Jews’ own choosing” to execute vengeance for their captivity in Babylon based on Esther 9. 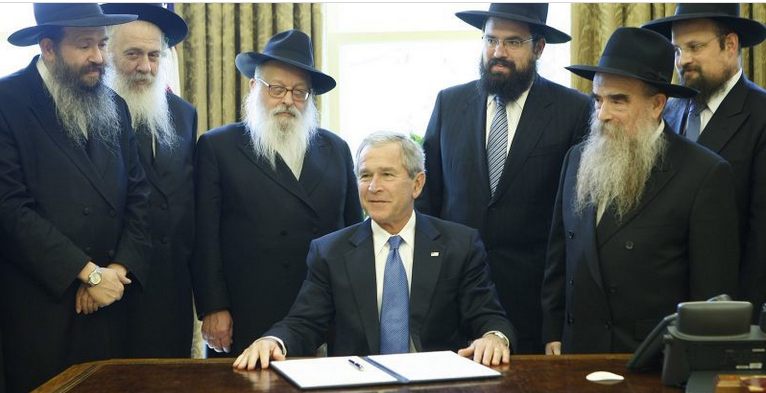 In 2003, President George W. Bush announced he would commence the bombing of Iraq at the “time of our choosing” which turned out to be March 17 or Adar 13, the Fast of Esther, the day before Purim. Purim falls this year on March 20, 2019. “March” is derived from Mars, the Roman god of War. “…the Sanhedrin’s ongoing effort [is] to establish a Bible-based international organization to replace the United Nations. “These are the seven messages of the Creator of the world to humanity known as the Seven Noahide Laws:..
4. “Laws: To establish courts to judge justice and to direct society and obey the orders and decisions of the courts.